This ceramic mug has a whimsical surprise when you get to the bottom of your coffee or tea, a baby animal is inside to greet you. Our Kids Surprise animal Mugs are a fun way to serve kids a variety of beverages, with a little jungle flare on the side. Crafted from ceramic, these mugs feature a whimsical giraffe pattern. Kids will go wild when they see a cute animal magically appear at the bottom of their mug. Made of ceramics, durable and heat-resistance. Volume: 400ml. Ceramic size:5.51"x4.3"x3.54". What a great idea for any animal lover. 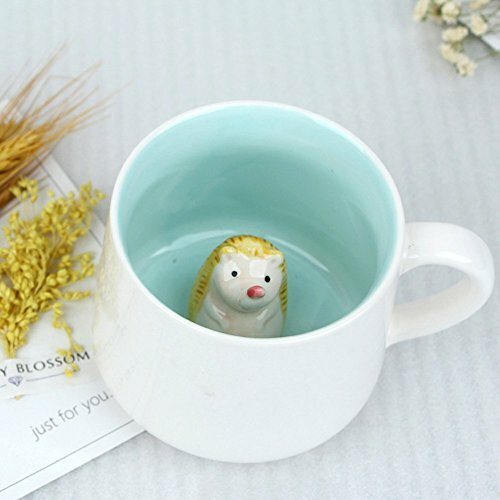 Enjoy a cup of coffee, cocoa, or tea in the company of a cute little animal; Kids and adults will love the novelty mug. Perfect gift for your childern, your family, your friends; Suitable for daily use, restaurant and party. If you have any questions about this product by Hotmiss, contact us by completing and submitting the form below. If you are looking for a specif part number, please include it with your message.